I’ve been meaning to write this post since the mid-January thaw, when I ventured to my local Aldi grocery store for the first time ever. Don’t get me wrong, I’m no stranger to Aldi. Growing up, my family did a decent bit of our grocery shopping there, and, as a college student and a grad student, I appreciated the affordable prices. I probably shopped Aldi most frequently my first year out of grad school, when I lived within half a mile of a store. When I was in grad school, I lived closer to Soulard Farmers’ Market, so that was my go-to source for produce (though often not locally grown). When you’re going by bike or on foot, it’s all about proximity! Anyhow, my biggest issue with Aldi was and is the packaging on the produce, which this site mentions as one of their cost saving strategies. In addition to saving cashiers’ time weighing bulk produce, I imagine prepackaging produce also cuts down on product loss — instead of being able to pick through for the best pepper, or the best apples, you take what you get, the good with the not-so-good. But it’s a lot of packaging, especially the items (like peppers) that are placed on polystyrene trays and then wrapped in plastic. Ugh! On the other hand, Aldi was one of the first stores to encourage bringing your own bags (again, as a cost-saving measure), long before it was en vogue or “green,” and some of their other cost-saving measures are also good for the planet, so it’s a bit of a conundrum. Anyway, my January trip was spurred by citrus season, and my memory of Aldi carrying fairly nice oranges and grapefruit for a very good price. Also, we have not bothered to unsubscribe from the weekly mailer that includes the Aldi flyer, and I had seen that they were starting to carry some organic items, including apples and bananas, and I wanted to check it out. They did indeed have good prices on citrus, particularly the three for a dollar grapefruit. On that trip, I came home with three grapefruit (not prepackaged! 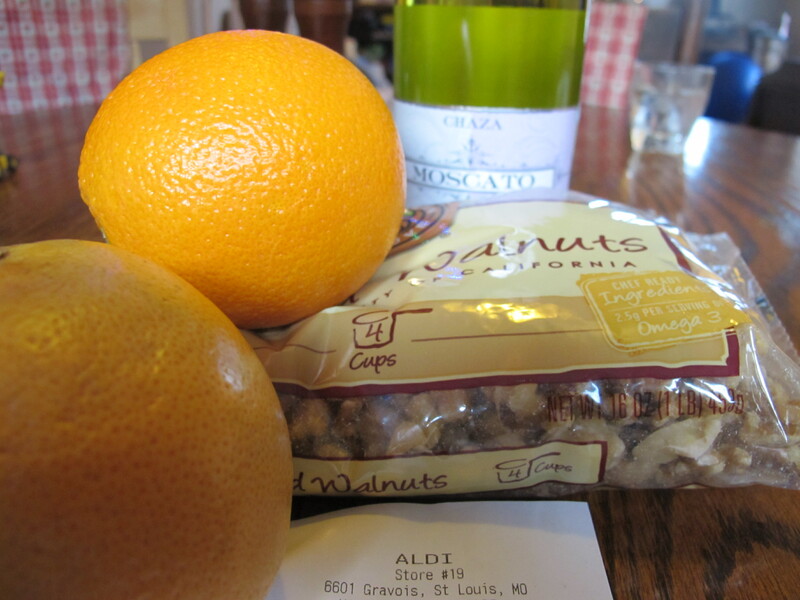 ), a bag of oranges, a bottle of wine, two 1/2 pound blocks of cheese, and a bag of walnuts (a pound for less than $8, vs. the $10+/lb I usually pay at the bulk bins). Finally, the cheese. I prefer to keep dairy consumption pretty minimal, and, as much as possible, organic [practices]. Avoiding dairy completing is tricky (and for us, unnecessary) and it does taste good. But organic and/or small-farm dairy, and especially cheese, is pretty pricey. Enter the “frugal foodie” debate. On this trip, I went ahead and bought a half-pound each of two cheeses (less than $2 each), knowing they were not up to my preferred standards for dairy. I find it ironic that many of the Aldi dairy (and perhaps meat?) products are packaged in their “Happy Farms” label, since I imagine the animals have far less than happy living conditions. But, to be fair, the dairy and meat products at Aldi are, in general, no worse ethically/environmentally/health-wise than similar, name-brand products at other stores. Enough on the food, though. 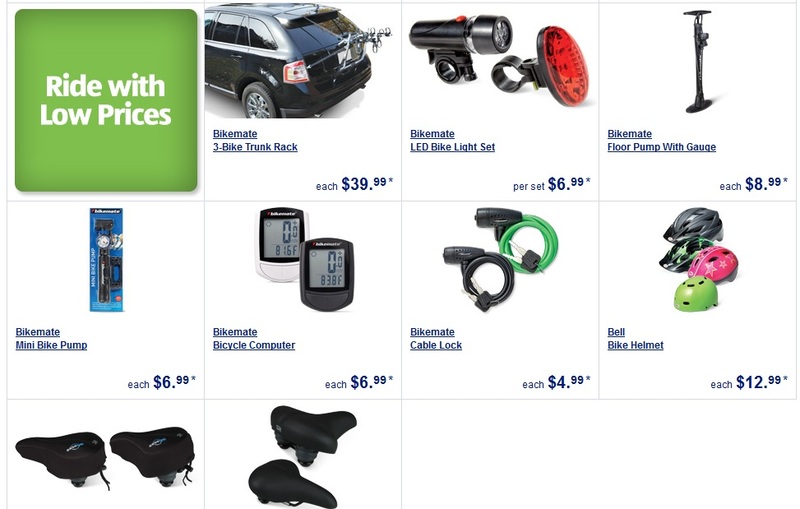 What finally spurred me to write this post was the current week’s flyer, which features none-other than BIKE accessories in the “Special Buys” section. While many of these items are not likely high-quality, if you’re trying to get set up for biking, and you’re on a tight budget, it would be better to have these lights, than, say no lights (but please don’t skimp on a good quality bicycle!). I’m particularly interested in the helmets, as my current noggin-protector celebrated it’s 5th birthday a couple of months ago (general recommendations are to replace helmets every five years (or after an impact)). With bicycle helmets, more money does not equal more protection. As long as a helmet has the Consumer Products Safety Commission (CPSC) stamp of approval and fits correctly, it is good to go! I do have a few other features I want in a helmet, so I’ll head over tomorrow (Special Buys don’t start until Wednesday) to see if my store actually stocks something that will fit the bill. This entry was posted in Biking, Food, Green Ideas, Not Green and tagged Aldi, frugal living, grocery shopping. Bookmark the permalink. Yes, Aaron! This article, which I also linked to in the post, mentions that as well. I didn’t realize the 5 year limit on bike helmets! It’s just as well since when I took out my 9ish year old helmet part of it had come off! We went to the bike shop for a new one right away but it was discouraging to see how cheaply made the first one was. The 5 year replacement guideline for bicycle helmets is a general industry thing, just like the “expiration” date on car seats. Personally, I think the material that helmets are made of is much more likely to break down than that of car seats. It’s probably a trade-off for having helmets made out of lighter-weight material, it just wears out/breaks down faster. Plus, after 5 years of regular use, even trying to be careful with it, most bicycle helmets have probably received a number of bumps and thumps that, while perhaps not as bad as a crash, contribute to the helmet not being AS protective as it could be. My dilemma — what to do with the old helmets? With three cyclists, and replacing [at least] every 5 years, they start to add up . . . .
Makes complete sense and I’m very conscious of the car seat issue so I’m surprised it hasn’t occurred to me. I put mine out on a combined trash and recycle pick up day hoping the recycle people would take it and I think the trash people did. Not really an ideal solution. I generally haven’t shopped at Aldi’s, though I’ve been thinking of them more lately, and I’ve wandered in (mostly out of curiosity) on more than one occasion. Indeed, there’s one next to one of my favorite Thai/Sushi places in St. Louis. Pros are reports of good produce, living wages, and cost savings (often on the most random things, like bike helmets, or my friend picked up a $100 espresso machine for $30 a year or two ago). My brother swears by the place. Cons include a general inability to shop with a list (an issue I often have with farmer’s markets and small markets in general, or even Target, due to time limitations), and concerns about labeling (last year products containing “beef” were determined to contain horse meat, and though it is now resolved, this sort of thing is one more reason I’m leaning pescetarian these days).